Figure ATR-1. First Nations historical treaties. Who has Treaty Rights? It is important to remember that all Saskatchewan residents, whether Aboriginal or non-Aboriginal, benefit directly or indirectly from the treaty relationships between First Nations and the Crown. Euro-Canadians and other immigrants, who today are the majority of the provincial population, benefit because it was through treaties that they acquired the right to settle here. These settlement rights for non-Aboriginals were granted in exchange for certain specific treaty rights to First Nations. As a result, it is generally assumed that “Treaty Rights” refers only to those held by First Nations because Canada's two other constitutionally recognized Aboriginal groups, the Métis and Inuit, were not treaty signatories here in Saskatchewan. Several First Nations lived in what is now Saskatchewan when the Numbered Treaties were signed. The largest of these were the Cree, Assiniboine, and Saulteaux in the south, and the Dene to the north. Nakota and Dakota as well as other Nations lived on the Plains region that includes the present-day northern states of North Dakota and Montana as well as the three prairie provinces of Manitoba, Saskatchewan and Alberta. The Canadian government sought to populate the area in order to prevent an incursion by the United States, which was rapidly expanding into the interior of North America. Its dilemma was that this area was already populated by tens of thousands of people who were wary of uninvited incursions into their territory. Rather than follow the United States' military western expansion against Indigenous peoples to the south, Canada relied on Treaties to open up its western territories. After much negotiation, Canada successfully entered into Treaties with the First Nations to open the North-West Territories for Euro-Canadian agricultural settlement. 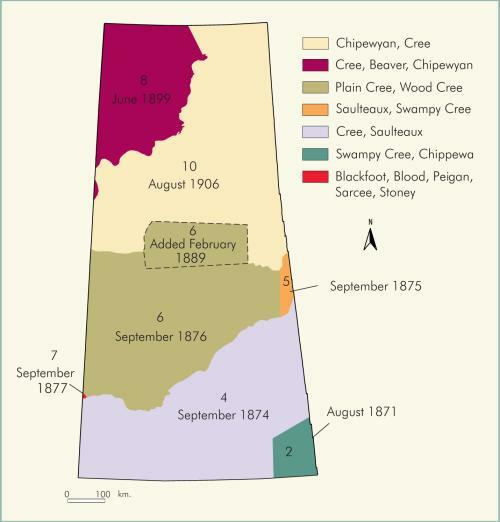 Although small portions of present-day Saskatchewan include lands from Treaty 2 (1871) and Treaty 7 (1877), the five major historical or numbered treaties of this province are Treaty 4 (1874), Treaty 5 (1875-76), Treaty 6 (1876), Treaty 8 (1899-1900), and Treaty 10 (1906-07) (see Figure ATR-1). These five Treaties are of enormous significance to the First Nations people of Saskatchewan, and are frequently referred to as sacred and solemn agreements that cannot be altered or broken without the mutual consent of all parties. There is a distinction between Aboriginal and Treaty rights. Aboriginal rights are those that stem from people's prior occupation of the land and are considered to be inherent. Treaty rights, on the other hand, flow from the agreements made between the First Nations of Saskatchewan and the Crown. Treaty rights that were secured in all parts of what is now Saskatchewan include: the ability to maintain a traditional lifestyle through hunting, fishing, and gathering; medals and annuities; clothing for headmen and chiefs; building and staffing of schools; and agricultural supplies. Certain treaties contained specific promises that were not included in other agreements. For example, Treaty 6 and Treaty 8 included two provisions for a “medicine chest” as well as aid in case of famine, although only Treaty 6 had them included in the written text. This “medicine chest” provision would later be interpreted by the courts to mean free healthcare. Unfortunately for Treaty First Nations, many of these promises were never carried or were arbitrarily altered by the federal government. One example is how the treaty promises of “schools” for First Nations Children became the ethnocidal residential school policy. Treaty Land Entitlement and Specific Claims have sought to correct some of the historical injustices caused by Canada's failure to live up to its treaty promises. Today, all Treaty rights are protected legislatively in section 88 of the Indian Act and constitutionally in section 35 of the Constitution Act, 1982. Unfortunately, the Treaties are ambiguous as to rights that are not specifically listed in the Treaty documents. For example, the right to self-government is one upon which the federal government has repeatedly attempted to legislate. First Nations have argued that the federal government has no such authority because the right to self-government was never surrendered during the Treaty negotiations. Another example of controversy has been whether First Nations have a Treaty right to economic development through gaming. This dispute has been managed with some success by the province and Saskatchewan First Nations through the creation of the Saskatchewan Indian Gaming Authority (SIGA). As a result, gaming has been a major source of economic development in the province for First Nations. Today, the Office of the Treaty Commissioner plays an important role in the interpretation and implementation of the Treaties' terms. There has been a growing consensus that the treaties are complex documents that represent a commitment to developing a relationship. Therefore, reading treaties as contractual agreements involving what would effectively be real estate transactions would represent an incomplete understanding. Canadian courts have ordered that oral history must be taken into account because promises were frequently made by Canadian negotiators that were not subsequently included in the written treaty. Examples include promises of no Taxation and no compulsory military service (Treaty 8), as well as of farming instruction (Treaty 4). The Treaties are crucial to understanding the relationships between Indigenous peoples, Saskatchewan, and Canada. For the First Nations of this province, the Treaties did not signify cession or surrender to Canadian authority but rather the establishment of a nation-to-nation relationship. Indeed, many First Nations are uncomfortable with tripartite negotiations between the provincial, federal and First Nations governments because this is seen as a derogation of the bilateralism that was established when the treaties were agreed upon.